If you are a wine lover and you haven’t been to Oregon, what are you waiting for? The wine industry in the Pacific Northwest is booming, and wine tourism is growing. There are several great wine regions in Oregon, but you can’t go wrong by starting in the Willamette Valley, which is just 30 minutes from Portland. It is a gorgeous valley of rolling hills and grand vistas. If you have never been to wine country, you might also consider Napa, Sonoma and Paso Robles in California. All three are spectacular. But, as someone once observed, they don’t plant grapevines in ugly places. Today we’re talking about Willamette (It rhymes with dammit, I was told by a winemaker years ago). There are dozens of great wineries in the Willamette Valley, and you could have great fun and learn a lot just by trying as many of these wines as you can find. 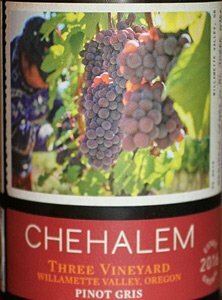 One of the early stars that still produces great wine is Chehalem (chuh-HAY-lum) Winery. It was one of the pioneers in growing pinot noir in Oregon, planting their vineyards in the early 1980s. Many people think pinot noir is the only thing growing in Oregon, but the state produces a wide variety of wines. I particularly like their pinot gris. It is the same grape as the pinot grigio grown in Italy, but the wines taste totally different. The Chehalem Three Vineyards is a good example, full of pear, lemon and spice with some minerality. There is some weight on the palate with rich, ripe fruit, but it is balanced by crisp acidity. This is a nice sipping wine, but it really comes into its own with food. It is straw-colored in the glass with pear, peach, apple and lemon on the nose. The first sip reveals more pear, with lemon and minerals. This is a versatile wine that can be an aperitif but also pair with many different meals. The grapes were grown on Chehalem’s three estate vineyards, Stoller Vineyards (58 percent), Ridgecrest Vineyards (29 percent) and Corral Creek Vineyards (13 percent). The grapes were fermented in stainless steel tanks and neutral barrels and then aged six months on the lees in tanks and barrels. I also tasted the Chehalem Inox unoaked chardonnay, and it was at least as good as the pinot gris. Aromas of honeydew melon lead to flavors of peach, apricot and lemon with a crisp mouthfeel. It also sells for about $20, which is a great deal on a wine like this. The name comes from inoxydable, the French word for stainless steel. The grapes come from the Stoller Vineyards (80 percent) and Corral Creek Vineyards (20 percent). Oregon wine people say 2016 was a great vintage, with great conditions throughout the growing season. Winter was warm and budbreak was early. Good weather lead to a record early harvest. At Chehalem the folks said the fruit was fully ripe but not overripe, with a good mix of acid and alcohol. The fruit was small and dense with intense flavors. At Chehalem they thinned the fruit during the season to encourage optimal ripeness and intensity. Based on what I tasted, I’d say they picked grapes at the perfect time. This is an exciting wine that shows you what Oregon pinot gris can be. 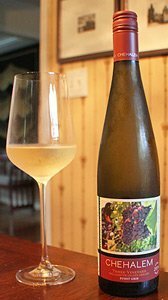 Chehalem produced 2,080 cases of pinot gris and 3,150 cases of chardonnay so they should be readily available. Both of these are great summer wines, whether you are at the beach, in the mountains, at the lake, or on the back porch. When I visited the Willamette Valley with my traveling friends in October, 2016, it looked like nearly all the grapes in the valley had been picked. There were a few hangers on probably left for a late harvest bottling. So I know harvest finished early. I don’t know how we missed Chehalem, but if I can get back there this will be the first winery on my list. Of course, after spending four nights in a rental house in the middle of Stoller Family Estates vineyards I was convinced I needed to get back to Willamette as soon as I could. Winery: Henry Peterson-Nedry bought his first land in the early 1980s and planted Ridgecrest Vineyards in the spectacular soil of Ribbon Ridge. He founded Chehalem Winery in 1990 and released his first wine, Ridgecrest Pinot Noir. Ribbon Ridge would later become one of the most celebrated AVAs in the region. Harry’s friend Bill Stoller joined the winery operation in 1993 and later planted his own vineyard on family farmlands at the southern end of Dundee Hills before founding Stoller Family Estate, which now has 210 acres of vineyards. It is the largest contiguous vineyard in the Dundee Hills AVA. In 1995 Chehalem had its third estate vineyard when it purchased Corral Creek, in the valley surrounding the winery. It has 32 acres under vine. In 2009 second-generation winemaker, Wynne Peterson-Nedry, joined the Chehalem team and took over as head winemaker in 2012. Earlier this year Peterson-Nedry decided to concentrate on his vineyard and sold his share of the Chehalem winery to Stoller. So now Bill Stoller runs both Stoller and Chehalem. It is a seamless transition as both families share values such as sustainability and innovation. 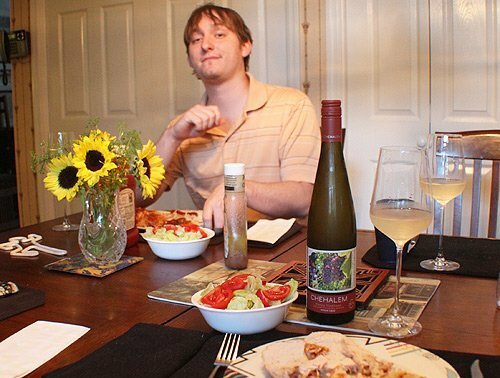 Michael liked the pinot gris with the chicken and hash browns. Goes with: We had this beautiful wine with one of those easy summer meals you have when it’s too hot to cook. I picked up a rotisserie chicken, pan fried some hash brown potatoes and added a salad. The kitchen barely got warm, but we had a good dinner, made better by the Chehalem Pinot Gris. I love rotisserie chicken because it is so versatile. We used it with this meal, and then I used some of the leftovers to build a club sandwich by adding it to the basic BLT. Sometimes I use the bones for chicken soup, and sometimes the meat goes into chicken tortilla soup. At our house the meals all seem to be connected. The bacon for the club sandwiches was part of the bacon I put into my creamy tomato basil soup, which turned out crazy good. The Chahalem pinot gris paired well with the roast chicken and fried potatoes. The flavors of the chicken didn’t overpower the wine. In fact, the wine brought more complexity to the table than the meal. The pinot gris would go well with offerings from a raw bar, or sushi, poblano pork stew, fish or poultry on the grill, or Asian food such as pork buns. I think it also would be good with foods in a rich, creamy white sauce. I put out a little more effort for the meal with the chardonnay, but not much. We had broiled lobster tails with Uncle Ben’s long grain and wild rice. The lobster tails are done in less than 10 minutes, the rice cooks on the stove in 15 minutes. We added canned peas and a salad to round out the feast. The chardonnay was perfect with the sweet taste of the lobster and butter. It also would pair well with oysters and other seafood, pork chops or chicken. The winery recommends trying it with chocolate, but we drank all of it with the lobster so I’ll have to try that another time.